When Kaitlyn first heard this song, she thought about what a great song it would be to sing at camp and knew she just had to learn it. It only took about a day for her to learn because she was so motivated. The rhythm was really interesting and Kaitlyn thought it was such an neat idea to learn a rhythm for the song with a cup to share with her campers this summer! She changed "whiskey" to "pepsi" since she's a counsellor for 7 and 8 year olds. Kaitlyn prepared written instructions as well as a video to help you learn the Cup Song. 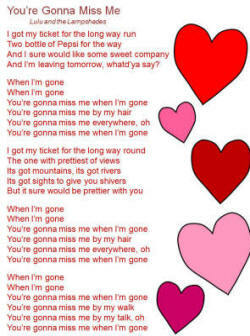 The lyrics for "You're Gonna Miss Me" by Lulu and the Lampshades are included below. For this technique you need a plastic cup (red solo cups work well but any plastic cup will do). It sounds the best if you do it on a surface with fabric on it. Start with the cup sitting upside down on the table. Hit the bottom of the cup 3 times (Right, Left, Right). Clap your hands 1 time. Pick up the cup and set it down. Turn your left hand over to pick the cup up. Hit the top of the cup with your right hand. Hit the bottom edge of the cup onto the table. Switch the cup from your left hand to your right hand. Tap the table with your free left hand. Place the cup down with your right hand. Repeat until the song is over. And I’m leaving tomorrow, whatd’ya say? This song was originally done by Lulu and the Lampshades and posted on YouTube. It was highlighted in the 2012 movie "Pitch Perfect".